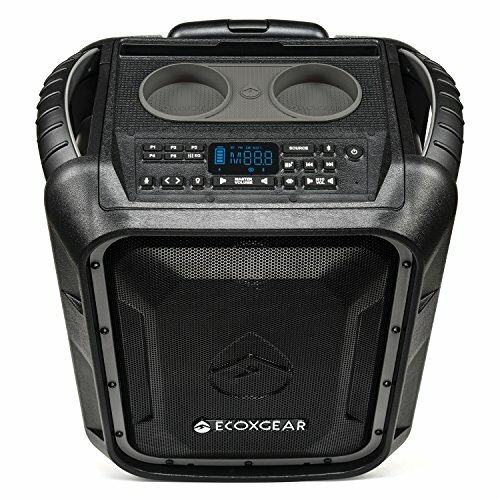 Pump up any outdoor gathering in an easy and user-friendly fashion with the ECOBOULDER+! This fully submersible speaker will pump some serious tunes with its 100 watts of power, an 8” full range speaker, 3” tweeter plus an 8” passive woofer! It’s designed to survive any outdoor elements such as water, dirt, and debris which are sure to present themselves at outdoor parties. The EcoBoulder+ also delivers 10 hours of playtime at full volume and 100 hours of standby time, meaning guaranteed battery life for an entire day of fun before needing to recharge. Take it with you with a telescoping handle and oversized outdoor wheels to offer easy transportation! The differences between the original ECOBOULDER and ECOBOULDER+ are the ECOBOUDLER+ adds a longer telescoping handle, bass and treble settings, EcoTalk which connects your Boulder+ to your phone's Siri or Ok Google Voice assistant, and instead of a fixed side waterproof compartment it includes a removable waterproof bag for your smartphone and accessories. 100% Waterproof and dustproof - meets IP67 international standards, no worries with rain, dirt or snow, drop the EcoBoulder+ in your pool, lake or ocean, no worries - it floats! Waterproof removable storage compartment allows you to keep your phone and accessories dry, keep them attached to the Eco Boulder+ or take the bag with you. If you have any questions about this product by ECOXGEAR, contact us by completing and submitting the form below. If you are looking for a specif part number, please include it with your message.